To out myself with regards to how passive-aggressive my relationship with wine has been, I got this Tablas Creek wine club shipment in April or May. Tonight while watching Micheal Phelps win another gold medal for being Aquaman, I finally entered the wines into Cellar Tracker. 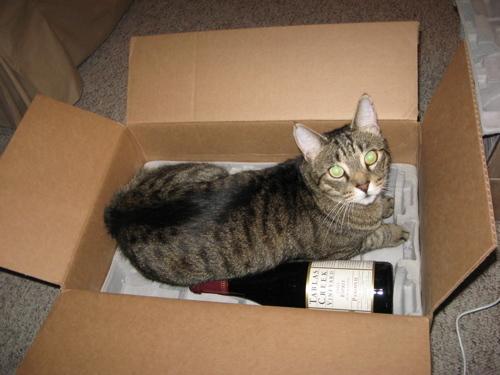 Not even because I thought the wine might be bored, locked for months in its shipper. 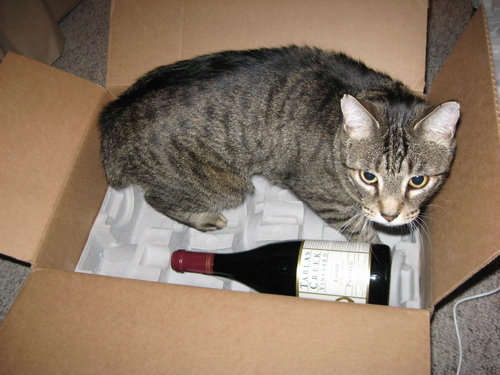 No, this weekend we’re having houseguests in for the wedding of some very dear friends, and I thought perhaps Mike shouldn’t have to worry about tripping over my unassuming brown box of exquisite, exquisite wine. As you can see, I had some help unpacking. If I my cats have learned to love Tablas Creek as much as I do, there seems to be a good chance that my child will as well. I did notice that I now have a couple of wines in my cellar that will still be drinkable when my kid is 17. Which, now that I think about it, is right when I’ll probably need a 17 year old bottle of Tannat or Riesling. That’ll be a good goal for building the cellar: what will wine will make for good enough drinking in 2026 that I’ll survive the years of my kid’s adolescence? OK, so the Scamp doesn’t like me laying my heavy trips on everyone who trips on in here looking for a tasty glass of wine. However, I have a lot of heavy trips (and preggo-related anecdotes/points of interest) on my mind lately. Add to this situation the fact that I could personally be responsible for the decline in wine sales this year (I made this up – I have no idea if wine sales are down) and we have here what The Dread Pirate Roberts would call an impasse. My hope is that I can land in that elusive place where I can manhandle both wine key and breast pump with equal dexterity. And isn’t that what all of us want, way down deep inside?